6:30am - We took a chance that there would be parking space for Little Honda and Scampy at the 24 Hour on Grossmont. And, there was! It's the last day of the year. So the usual Saturday crowd at 24 Hour must be sleeping in. Today is the first time since I was stricken with bursitis in my right elbow that I'm able to do a full workout. I've been doing partial workouts, to exclude that elbow. Still, I'm being very cautious with the weights when doing exercise with my right arm. Sorta easing into it. We arrived at 24 Hour at 6:30am and left the club at 9:30am. Fantastic for me to be able do this again without pain! The WalMart Grocery is very close to 24 Hour Fitness and we had a good size grocery list. So we went over there. It's not a good idea to park Little Honda and Scampy in the WalMart parking lot. Takes two spaces. Parking is much in demand at WalMart. We don't want to piss someone off! We parked across the street in an office parking lot. It's Saturday and nobody is working at that office. One of the things that we bought at WalMart was chicken. We fry up all the chicken on returning to Scampy because after frying it stays good under refrigeration. Raw chicken in the fridge goes bad fast. Scampy doesn't have a freezer. And all the rest of us! We wish for you that 2017 is your Best Year Yet! We love you all sooooo much! 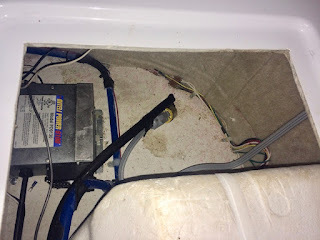 7:30am - Recently we Blogged about Scampy needing some kind of shore power to keep her deep cycle battery charged. Reader's comments came in offering three suggestions for power. PS: Yesterday, we learned that Scampy's incandescent fixtures could be converted to LED fixtures by simply changing the bulbs! If you would be interested in finding out more, Click [here]. "...it seems to be important to me to create a certain style for this new camping life I am in." Clean Scampy and Little Honda myself. No car wash. Clean Scampy using rags and abrasive sponge. Whisk brush with dust pan. This includes Scampy's floor and walls. Just as when you go camping, the great joy comes from setting up camp. And doing all the necessary camping chores! Scampy has a gas range manufactured by Suburban. It's a pretty good stove. Except! In my opinion, nobody at the factory conceived of the idea of "field testing!" If a company does NOT field test their products, then that company has absolutely no grasp how well that product works when customers use it! Below are images of two things on my Suburban that were never field tested. This pic shows a screw that secures the range top. Notice that this screw goes Down thru the top. 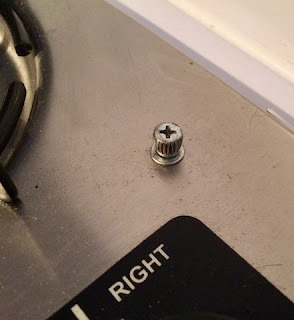 Question: How does a user fasten the top using a screw? The screw should be replaced by a threaded stud coming up! Screw inserted Downward into threaded clip. Screw should be inserted UPWARD thru threaded clip! The upward screw then would be secured by a threaded nut! 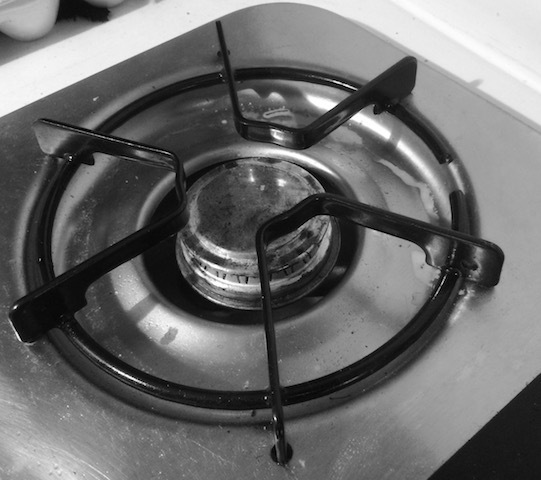 Stove top burner with black top permanently affixed?! Wouldn't it be nice to have this black top removable. For cleaning the pan below? 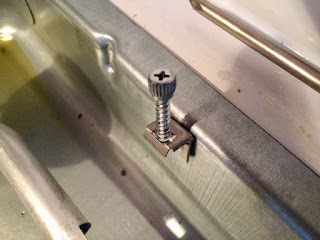 6pm - All that was necessary to get the screw to go UP instead of DOWN was to put the screw into the bottom of the clip. 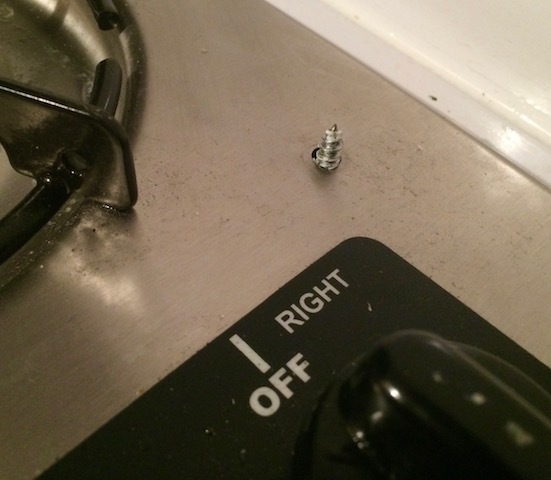 It is sooooo easy to find that screw by moving the stove top around a bit. A threaded nut will now be used to secure the stove top. Screw now comes up. Instead of going down! Easy!! Companies that do not field test their products must be run by idiots. Because to fail to field test, such companies are shooting themselves in the foot. My Joy In This New Life! 2am - It's a bit crazy for me to be up Blogging at this early hour. But wait until I Blog to you about the other stuff that I did. Then you'll know just how crazy it really is! Remember in yesterday's Blog, the part where there was no room for Honda and Scampy to park at 24 Hour Fitness. And we wrote that our work-a-round plan was to return when there would be space in the 24 Hour Fitness parking lot. Well, that's exactly what happened! We parked in the big Grossmont Mall parking lot [across from 24 Hour Fitness]. Little iPhone's alarm was set to 10pm. And I went to sleep. Little Boid was already sleeping in his cage on one side of my bed. At 10pm the alarm woke me, and off we went over to 24 Hour Fitness. Sure enough, we found loads of parking. More than enough for Scampy and Honda! It may sound weird, but I got such a big kick out of doing the stuff that I did today! Driving to another nearby 24 Hour Fitness on University Avenue. Learning that the 24 Hour Fitness on University Avenue has no shower, no hot water, no spa, no towels. Decided to return to the Grossmont 24 Hour late at nite when there would be parking. While in the spa, a guy started a conversation with me. He told how he was a druggy, down on his luck. Went broke. Went into rehab. Turned his life around when he became a born-again Christian. After that life changing event, he married, has five children, a great job [all in 10 years]. At 12:30am made a Nite Camp at John and Mimi's. 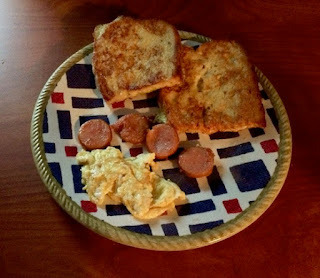 2am - Was hungry, so made breakfast! I have not figured out all that is motivating me since beginning to camp with Scampy. It's something that I am figuring out day-by-day. The thing is, I'm adventuring now as I've never adventured before. But it seems to be important to me to create a certain style for this new camping life I am in. I have to go to sleep now! My brain is groggy. But for sure, I'll clue you in about what is going on with this style stuff when I figure it out myself! PS: I usually proof read my Blog posts so that there are no errors. However, I am sooooo sleepy now. I didn't do my usual proofing. Please excuse me for that. 7:30am - Wherever we go, all of us on the Scampy RV Team all go together. Could it be any other way? When we go grocery shopping and return from the store, everything that we bought gets put in its place right-away! We have Mr Dometic with us. Stuff that we bought that needs to be refrigerated, is stored right-now. When George needs a potty, no looking around for an available men's room is necessary. Scampy has his own toilet/shower room. When George needs a nap during the day, he takes his nap inside Scampy. Something to eat? Scampy's kitchen is right there waiting! This morning we are shipping two packages back to Amazon. Part of the returned HUGE solar panel that was previously shipped back. Amazon shipped the solar panel to us in 3-separate packages. So, it is required by Amazon [as I understand it] to return in 3-separate packages. The closest 24 Hour to our Nite Camp at John & Mimi's home is the one on Grossmont. But that location must be extremely popular. The parking lot and surrounding streets had no space for Honda and Scampy. There is another 24 Hour on University Avenue. So we headed there. There is a work-a-round! We plan to go to 24 Hour on Grossmont late at nite! 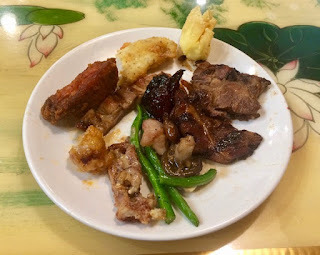 When we lived in The City of La Mesa, China Super was our favorite restaurant. This place knows food prep as few other restaurants know food prep! Every bite of China Super delicious food is a treat to the senses. How do they do that!? The plate below is all that I am able to eat. One plate and a bowl of soup fills me up. Other customers go back to the buffet time after time. I am jealous of those customers! PS: We wish to share our fortune cookie with you! no such thing as yesterday or tomorrow." 2pm - Pic especially for Reader Bob! "How about a pic of Scampy & Honda together or have I missed it?" Here it is, Bob. Especially for you! We have made an Afternoon Camp. Click [HERE] to view our Google Map location. As you may see for yourself in the Google Map, this Afternoon Camp is to close to I-8 to make Nite Camp here. Too much traffic noise. We are considering our Nite Camp next to Dixieline Hardware [after their 6pm close]. On the way here, shopped at The Wal*Mart Grocery and bought "Top Job Basic Cleaner & Degreaser." 6:30am - John and I are golfing this morning at Lomas Santa Fe Executive Golf Course [link]. Lomas Santa Fe is a lovely course. It's close to the Pacific Ocean. On very warm days, when other golf courses are sweltering, Lomas is usually perfect for golfing. What is an Executive Golf Course? Click [here] to find out! Why the Scampy RV Team stealth camps? My motivation to Stealth Camp originated from a need for free camping during the several years after I began to RV. I do not need free camping now. I could afford to stay in an RV Park. But I prefer Stealth Street Camping. I enjoy it! Is it against the law to camp on a public street? In most areas of the United States, there are laws/regulations against sleeping in a vehicle. And most municipalities do NOT allow camping on the street. This means that what I am doing when I camp on the street is against the law. And I do it anyway. I am a law breaker. I am a law breaker in this one area only. In nearly all other areas, I follow the law religiously. My Opinion about laws: All governmental entities pass laws and regulations. As time goes by, more and more laws and regulations are passed. In this regard, all governmental entities appear to have a need to govern everything that people do. I am against such unlimited power. Luckily, in time, these laws and regulations become a huge governmental burdon. Citizens will eventually stop obeying many of them. And the shear weight of all of this has toppled governments the world over. Here in the United States, I believe the same thing will happen here. Only time will tell! It is a tradition with John and myself, that after golf, we go to a burger joint for lunch. We used to always go to Five Guys Burgers. Several months ago, we switched to The Habit, a burger joint that was founded in 1969. In my opinion, The Habit uses better quality meat in their burgers than most other burger joints. John ordered a Double Cheese. I ordered a Single Cheese and Onion Rings. Very good! On returning to John and Mimi's home, I washed Scampy. Wow! Scampy was really dirty. In the future, I'll have to wash Scampy more often. This morning, before going off to play golf, I left Little iPhone playing music. Baby Boid loves music. And since I love Baby Boid, I cater to him a lot. Playing music, is one of the things that I enjoy doing for Boid. 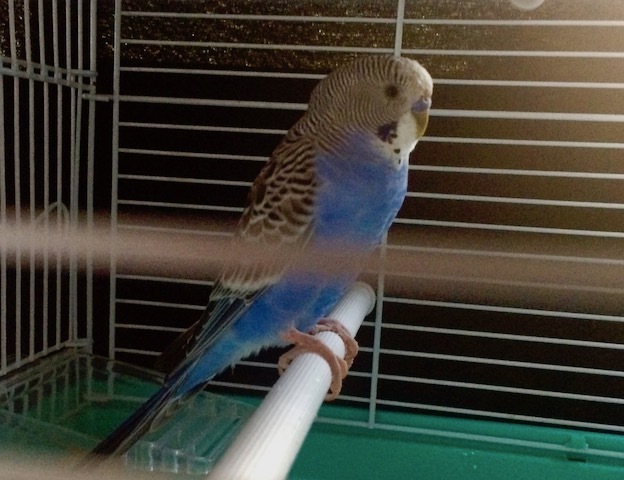 Boid makes sounds that I am sure copies the music he hears. When music comes on that is what he really likes, he tweets up a storm! Boid being happy like that, attracts everybody who sees him. Boid is an extremely engaging guy! Isn't Baby Boid good looking? 7:30 am - My years of living a nomadic RV life, has shown that discipline is a vital characteristic in order to do it successfully. 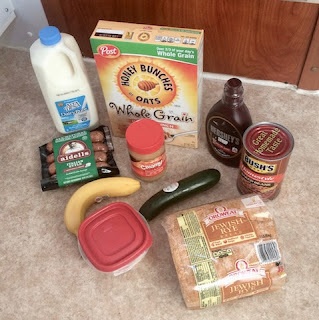 I've limited this Blog post to a nomadic RV life. This would also be the same for an RVer who did not travel and lived in one area. But away from RV parks! The reason for this separation is that RV Park Camping is very similar to living in a brick and mortar home. Note: I'm seeking comments from Readers who are RVers. Agree/disagree? Any additional disciplines? Right away as I began shopping at Albertsons, it was obvious that prices here are high. Very high! But I continued shopping instead of going to Food-For-Less. I figured, OK! They got me this time, but there will be NO next time. We are making our Camp near where we used to live. Guava Gardens Apartments. Check out our location map below. Never got to 24 Hour Fitness. Ran out of daylite! Another really good movie. "Cast Away," starring Tom Hanks. 10am - Yesterday I received a huge solar panel that was ordered from Amazon. It's not clear what was going on in my head when I bought it? The were no dimensions in the online description. It just did not dawn on me to question the size!! I had planned on having this panel setup when I boondocked. However, this panel is about 50" long x 36" wide! It would occupy Little Honda's entire storage area. I knew the moment that I first saw it, that I could not keep it. Right now, this solar panel is loaded into Little Honda for return to Amazon. PS: It turns out that Scampy's battery stays fully charged without hardly any need for using outside power. When Little Honda is driving, electric power is sent to Scampy's battery. Yesterday, Scampy's battery had a 1275 to 1300 hydrometer reading in all cells. Can't get better than that! Reader Squire: "Take a look at...Renogy 100 Watt 12 Volt Monocrystalline Foldable Solar Suitcase." 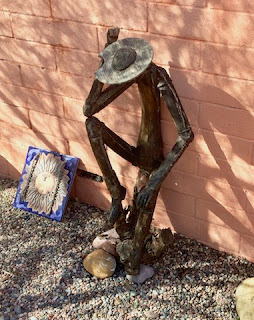 Reader Dale P: "Mount on little Honda roof. Use a cable which has plugs on both ends?" Reader Squire's comment started me thinking about different solar panel configurations. Which led me to "flexible/bendable" solar panels. Reader Dale P's comment got me to thinking about mounting the panel on Little Honda. It seems that a combination of these two comments is the way to go. Buy a flexible/bendable solar panel now? Wait until the need for solar power develops. Then buy. It appears that "wait until need develops" is the answer! 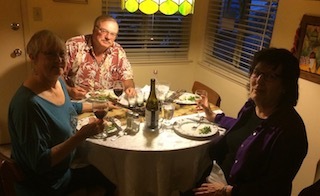 Four persons were at the supper celebrating Christmas. Mimi has been saving a gift for me. 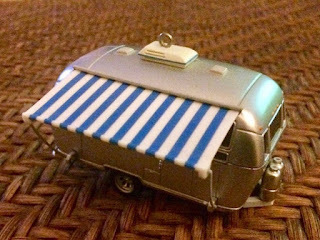 It is an exquisitely made tiny RV trailer. It is a Christmas tree ornament! 8pm - 3rd day "Dances With Wolves"
Little Boid and I are back with Scampy. Little Boid wore himself out socializing with Mimi, John and Joanne. He wore himself mainly because Mimi practiced singing her Christmas songs while Boid sat near Mimi in his cage in the kitchen. Boid has a love for the sounds of music. And today, that music sound came from his new friend, Mimi. On returning to Scampy, Boid went beddy-bye right away. The inside of his cage when covered with black fabric, is very dark. I placed the Wave3 heater a very short distance from my feet. Then began watching "Dances With Wolves." This will be the 3rd day watching this movie which is 3-hours long. The movie should finish this evening. PS: "Dances With Wolves" won an Academy Award for Best Picture in 1990. Great flick!! PPS: Click [here] to watch "Dances With Wolves" trailer. 7:30am - Now that Scampy is Tweaked, it’s so comfortable adventuring with her. Scampy is only 13 feet long. But it’s her inside dimensions that count! I am typing this Blog post using the dining table and sitting on the bench seat. Looking at the far wall, it feels sooooo roomy! Last nite we checked out if any lite leaked thru the stealth curtains. Those black curtains are great! No lite can be seen from the outside. However, it is now clear that two additional stealth curtains are needed. One on the window behind the stove top. The other for the entrance door. Then, Scampy should be as stealthy as can be! Scampy has a nice shower. Very convenient to have a shower where you live! 24 Hour Fitness has showers too. Big, roomy showers. Hot water without heating Scampy's water heater. Free towels! I showered and shampooed this morning at 24 Hour Fitness on Balboa Avenue. Then, soaked in the spa. Is this the life? Or what? 12 noon - Do you know where we are now? Below is a Little iPhone captured pic. Little iPhone took a pic of this place during our first Scampy trip. This a famous view of a famous City! 2:30pm - Invited for supper! I'm invited to John and Mimi's for supper. Yaayyyy! I love to visit with them. 7am - When the Lone Wolf office opens this morning, we will tow Scampy to the RV washing pad here in the park. Scampy needs a washing. Even the rain did not completely do that job. While at the pad, we will do our clothes washing at the building just across the way. Then Scampy will park at Twayler's site and do prepping. Before Scampy and The Team head out, the little quartz heater will be set to 55℉. Just in case an unexpected cold snap arrives. We do not want Twayler to freeze. Last thing: We will all say, "Bye bye, Twayler! See you in a couple of weeks!" Then we will head out for the trip to San Diego! Here in Apple Valley climes, one of my favorite breakfasts is Quaker Oatmeal and a cup of hot chocolate! Yummm! I used to do oatmeal cooking in the microwave. But that makes such a mess! Now I cook oatmeal the old fashioned way. 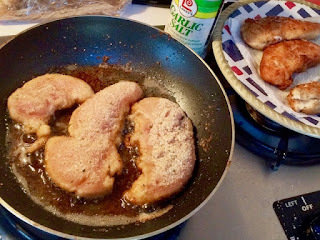 On the stovetop. Also, it is enjoyable watching the oatmeal cook and stirring it to perfection. 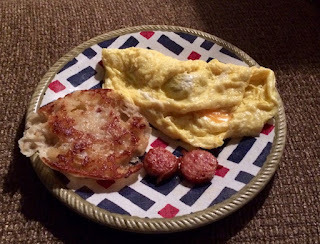 PS: This 9:30am Blog post will likely be our last from Twayler until our return from this Scampy trip. In a short while, we'll be heading out! Old George needed a rest. So, we have stopped on a dead-end street in the City of San Bernardino. PS: We are NOT resting on the roof of a building, as Google Maps shows [slight GPS deviation]. We are in the dead-end street, next to that building. In 2003, when MsTioga and I began our great adventure, an RVer was able to Street Camp almost anywhere. 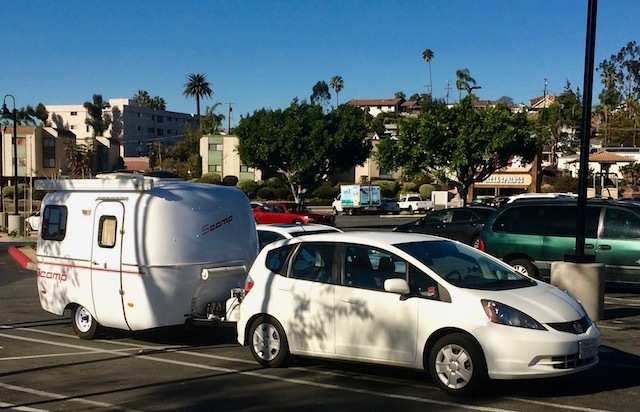 As the years went by, Street Camping became harder for RVers to do. It was kind of like, homeowners said, "We don't like RVs staying in our neighborhood." And they would turn it over to police. Local laws came on the books. Street signs followed. Soon, desirable places like San Diego County, crushed Street Camping. That was when the TiogaRV Team developed into an indomitable force. We moved Street Camping into an art form. That was when Stealth Camping was born! One of our techniques to avoid detection, was to make our Street Camps in unexpected locations. We are in one of those locations right now. It is up on Claremont Mesa. In a commercial/industrial zone. For several years when we Street Camped on Claremont Mesa, we were the only RV doing Street Camping in this entire area. However, recently when we began RVing again and went to make a Street Camp here on Claremont Mesa, we found dozens of RVs doing the same thing! How did other RVers find out about Street Camping being OK here? Could they have gotten info from our Blog Posts? Wondering? As is our practice, we do not go to our Nite Street Camp until later in the evening. Late camping minimizes the chances of complaints from nearby homes. We first make an Evening Street Camp where we make supper, and mess around until around 10pm. Then we move to our already scouted Nite Camp. 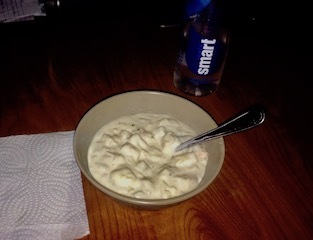 A delicious bowl of Campbell’s Chunky New England Clam Chowder. Wow! That soup was sooooo good! For music: Pavarotti’s Greatest Hits Album. The one that I just go crazy for is: “Turandot: Nessun Dorma!" Baby Boid is hopefully sleeping. I am keeping the music pretty low. Boid's cage cover is black, from the material for our Stealth Curtains. That should keep light from bothering Boid. 9pm - "Dances With Wolves"
This is the movie for this evening. Have you seen it? It's an all-time great! I just started watching it. It has a 3-hour, 1-minute run time. That means that I will not get to my Nite Camp site until after midnite. I have made a commitment to myself, to stabilize sleep my habits. That means that I go to bed and get out of bed at the same time each day. 11pm go to bed. 6:30am get out of bed. The iPhone just alerted me that it is now my bedtime. I wish to keep that commitment. So, I have shut down the movie and am going to bed. The place of my Evening Street Camp seems to be OK for our Nite Camp. It is very quiet here. Not much traffic noise. Lot of wind though! So, we have decided to remain here for the nite. 12:30am - It does NOT seem to be a good idea to head out on a Scampy Trip in the middle of a storm. The Apple Valley weather forecast indicates that Sunday would be a much better day. So, that's that! We are re-scheduled. Instead of the Scampy Trip, we are treating ourselves to a movie this morning. Rotten Tomatoes has given Rogue One a rating of 85%! That's pretty high. We have set our iPhone alarm for 9:15am, an hour before this movie begins at the DigiPlex Theater. By the time we head out to see the movie, Scampy's installation of the new AC shore power cable should be complete. The new shore power system, cuts off the original cable that came with Scampy. That original cable is huge! Must be about 4-gage!! And Scamp Trailer stuffed that cable into one of the dining table bench seats. Helter-skelter. It was a mess! We cut off this huge cable and soldered on 14 gauge wires to each of the three 4-gage cable wires. These wires go into a 3-wire male connector which then plugs into a 6-foot long extension cord. The other end of this extension cord passes outside thru a hole in Scampy's wall. Connecting that 6-foot extension cord to shore power is done with a 50 foot long extension. This new Shore Power System is much more suited to our electric power requirements. After all, we are only using electric power to recharge the Mac Air Computer, iPhone and miscellaneous electronic devices. We also have a 750 watt electric heater on board that the New Shore Power system should handle nicely. I walked out of the Star Wars movie! I hated the way the story was told. Jerky character and story development. If George Lucas had anything to do with the production of this movie, I'd be very much surprised. Watching most of the coming attractions, is agony for me. The new kind of movie, is all noise, chases, fights, killing. And NO PLOT! Are these coming-attractions representative of movies that people enjoy today? Baby Boid and George just got back from tweaking things over at Scampy's. Baby Boid just loves to go out and do things. He gets sooooo bored when he is left alone inside Twayler. Wherever we take Boid out, we play music especially for him! It's a treat to see how much Boid loves music. He tweets up a storm and sometimes bobs his head up and down. If the music stops. Boid stops doing these things. 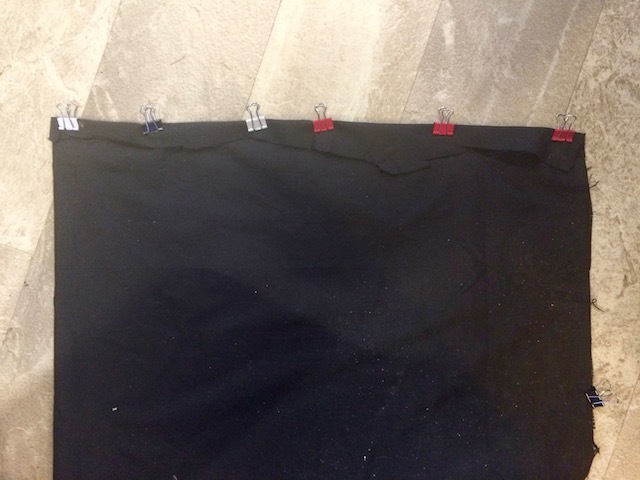 One tweak was to affix small Velcro squares to hold Scampy's stealth curtain close the window frame [so that light does not show to the outside]. This morning, Little iPhone took before and after pics of the inside of the bench seat. The pics below show the difference. 7am - There are things that are inconvenient to do here in Apple Valley. Because the proximity to those things is far. Go to Apple Store- Little iPhone needs a checkup to find out why his Personal Hotspot only works AFTER resetting network. Also, we bought a bunch of movie videos from iTunes. We have most of these videos stored on a 2 terabyte drive. We need help with the remaining movie videos. Kaiser Permanente- The closest Kaiser dermatologist is in Fontana. Too far to drive! But in the San Diego area, dermatologists are close. The plan is to make a dermatologist appointment while still in Apple Valley for a San Diego area doctor. 8am - Do you remember Weng? First of all, the name "Weng" is not her real name! She got that handle on immigrating to the US. Her real name is, "Rowena." BTW, I like the name Rowena much better than Weng. Rowena and I are close friends. We talked last nite on the phone for 1-1/2 hours! That's how close we are. Rowena has a Christmas tree. 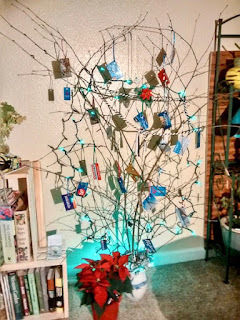 But this is not the usual Christmas tree. Rowena does landscape gardening for a living. 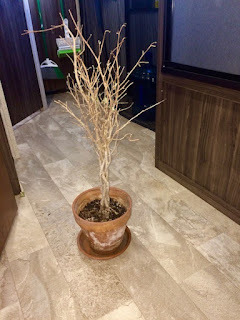 She brought home cut off branches from one of her projects in order to "construct" her Christmas tree. 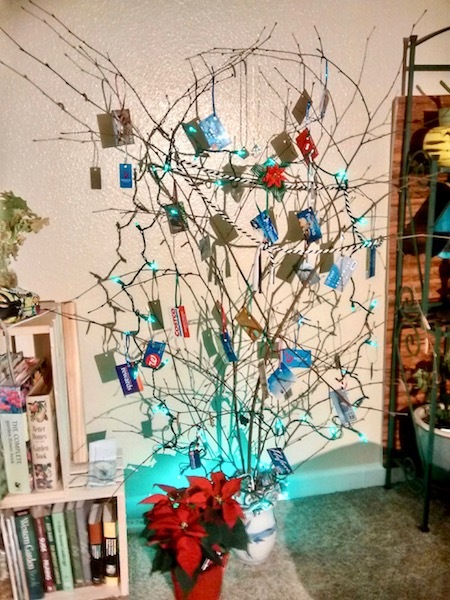 The ornaments are credit cards! Ones that she saved because they were no good anymore. Wanna see that tree? 12 noon - A secret thing! In this 12 noon Blog post, I am going to share a secret thing with you. But please! Don't tell anybody this secret. It's just for you. Earlier this year, during my trip to Guatemala, I became ill. My doctors could not diagnose the cause this illness. But one of the symptoms seemed to be "a loss of my appetite." My weight at that time, was 183 pounds. Gradually over several months, my weight went down. 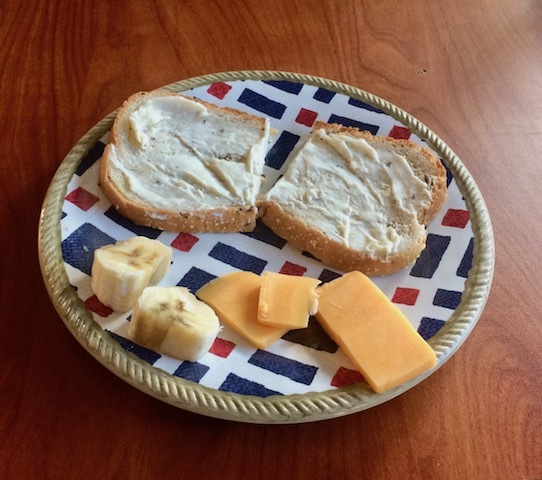 At my most recent Kaiser visit on November 17th, my weight was 158 pounds. That was my weight when I had 20 years. Also, I was diagnosed with high blood pressure and was receiving medication for that. At my last several Kaiser appointment my blood pressure was 113/66! Being sensitive to the food that I am eating so that I am able to turn away from that food when I no longer feel hunger. What happened to me over the next several months changed my entire life! It seems that the way I make decisions, were greatly impacted by the simple act of consciously turning away from food when I was no longer hungry. I began what I call, "Conscious Thinking" in all of my decisions. I learned that all of my decisions before this time, were kind of "subconscious." That means that I was not aware that I was making a decision. "Is this what I really want to do?" "Is this really good for me?" I am guessing that you may be thinking to yourself, "I do that all the time. What's the big deal?" However, for me it is the biggest deal of my life! Changed everything! Remember! This is a secret thing, only for you! Mums the word! Note: In the 12 noon post above, I defined "Active Thinking." Active was not the correct word and has been replaced with Conscious. So the term is now, "Conscious Thinking." 6:30pm - Replacement Dish MODEM arrived! On going to pick up my mail this afternoon, a package from Dish.net was there as well. I believe that I Blogged to you more than a few times about my poor Dish.net service. The package contained my replacement MODEM. My Dish internet service should now be back to normal. Excitedly, I took out the old MODEM and put in the new. Nothing!! Only two of the four MODEM LEDs lit up. When I phoned Dish for help, the tech told me that there was a setup routine in order to put a new MODEM into service. The tech worked with me for over an hour. But at the end, we are now back online! 7am - Baby Boid is no longer afraid. He allows me to pet his blue chest. I may also hold him gently, with my thumb and index finger. 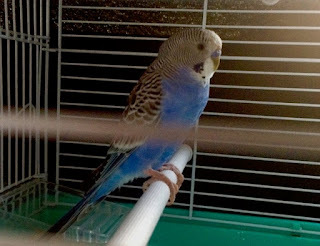 But for now, only while Boid is in his cage. 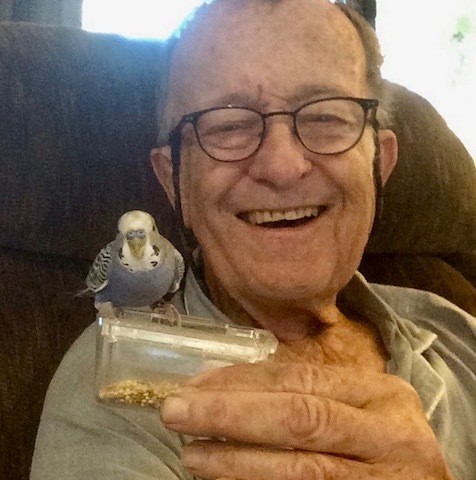 In the pic below, Boid is eating his seeds from his seed cup while I am holding that cup. Eventually, Boid will eat his seeds from my hand. After the replacement hitch was installed in Little Honda, we returned to Lone Wolf. We asked permission to park Scampy on Twayler's site for awhile [It's against Park rules to park vehicles in storage on RV sites. That's why we needed permission]. When we went inside Scampy, we noticed straight-away that the kitchen sink spout had come loose and was now lying in the sink's basin. When going to screw the spout back into the faucet, it wouldn't go!! What had happened was, the water inside the faucet body froze and expanded enough to eject the faucet. It would be necessary to warm the faucet body to melt that frozen water. Our Dish MODEM is pretty much not functional. Dish is sending a replacement MODEM. tap Settings > General > Reset > ResetNetwork Settings." It's necessary to Reset Network Settings every single time in order to get the Personal Hotspot to work! That is NOT right! The thing is, right now there are times when a try to make a Blog post does NOT happen for an hour or more because of failure to access the internet. Bummer! 2:30pm - Scampy's stealth curtains are up! And they are sooooo stealthy. Better than I ever dreamed! To keep the curtains as sealed as possible. clips hold the curtains to the window frame. Only two clips are needed. One clip on each bottom side corner does the trick. From time-to-time, I try to look up friends that I've not heard from for awhile. I am kinda gun-shy in this endeavor. Because at my age , the news is often sorry. As in, "Sorry to tell you. Paul passed on about two months ago." I have not heard from Mike Fousie for awhile. His website is/was "LightCurve.com." When I went there a few minutes ago, his URL was for sale with Go Daddy. I suspect that Mike has gone on to that never-never land "...Where each shall take their chamber in the silent halls of death." And yet, I myself am going strong! Confidentially, I never figured that I would last this long. 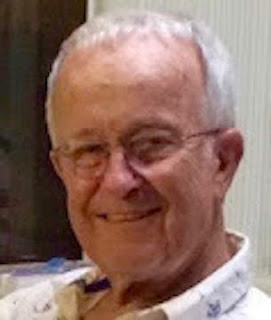 A doctor told me when I was 40 years old, that I'd have surgery to correct a congenital heart defect when I was about 65. That actually happened. But I was 77 when it did happen. When I was living in Mexico, I had dizzy spells. Didn't know why? Turned out that these were a symptom of my heart disease. You may recall that I stopped all medications around last August. Since then, I have felt sooooo good! And my entire life changed. I bought two RV trailers, and moved to Apple Valley. 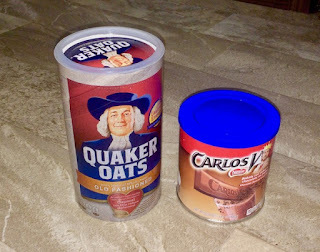 7am - It's been years since I enjoyed Quaker Oats for breakfast. Last nite it got down to only 25℉. Not 21℉ as the nite before. But plenty cold for this California born and bred boy! Carlos V Hot Chocolate [Nestles] seemed like the perfect companion drink on this super chilly December morning. Yummmm! 7:30am - Frozen water solved! This morning, while still in bed, my mind drifted over things. And one of those things was the recent freezing of the water inside Twayler's city water supply hose. It dawned on me that Twayler has two water supplies! One from the city water supply. The other from her fresh water tank. 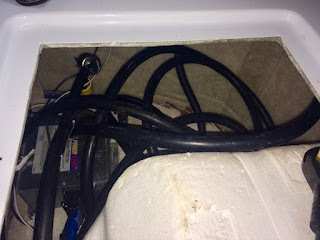 All that is necessary to do, is disconnect and store the city water supply hose, and no more frozen water problem! Why did I not think of this yesterday? Hmmmm? In addition to the Elephant Ear Palms that I blogged to you about yesterday, also brought in for protection - a Ficus Benjamina. As you may see in the pic below, there are no leaves. But we on The Team have a hunch that down deep, there is life and green leaves anxious to emerge. Is there life in those bare twigs? 7pm - Hitch install tomorrow! We on the Scampy RV Team are very excited because tomorrow morning at 8:15am, Little Honda goes to A&B Hitch in Hesperia for the replacement hitch. You may recall that George jack-knifed Scampy, resulting in the hitch destruction. Honda also received bumper damage and a bit more light damage to the panel just behind the left rear door. 6:45am - Twayler's incoming water supply is carried by a hose. 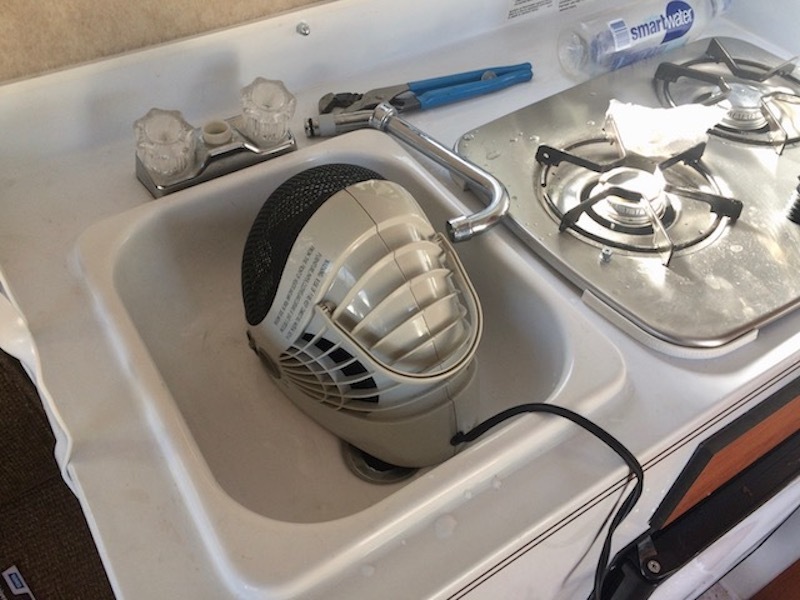 Last nite the kitchen faucet was set to drip, so that the water in that hose would not freeze. Awhile later, it was noticed that the grey water tank meter registered full. When the grey water dump valve was set to open, it would not fully open! Was it frozen? With the grey water tank full, setting the faucet to drip was not a good idea. This morning we found that no water now comes from the kitchen faucet. Must be frozen water in that hose? The faucet was left open, hoping that a tiny bit of water could come thru. But so far, no water. In yesterday's blog post we wrote that 25℉ was the predicted low. It is now 21℉! PS: It is now 7am and the kitchen faucet began a slow drip. About 1/second! Just remembered that I'm going to a production of The Nutcracker this evening at 6pm. The ballet is being held at Granite High School here in Apple Valley. I am sooooo excited about being there! The temp is up to 42℉. Apparently Twayler suffered no plumbing damage due to the 21℉ cold snap! The water is running, both cold and hot. Turn off and drain the incoming water hose. Drain both black and grey holding tanks. Have at least 1-gallon water for hand washing and toilet. Last nite's temperature plunge to a low of 21℉, killed what was left of the flowers and injured badly two elephant ear palms. I brought the two palms inside Twayler and propped up their now sagging stems. I'm hoping that being in this protected environment will give the palms a chance for survival. Little iPhone captured this pic below of the Nutcracker Ballet performance. I read on Google, that 40% of the revenue of all USA ballet companies comes from ticket sales to The Nutcracker! I've been going to Nutcracker performances for decades! Thank you, Pyotr Ilyich Tchaikovsky! 8am - Outside it's 34℉. However, inside Twayler, it's a comfortable 63℉. We are getting this nice temperature with a small, low cost quartz heater. 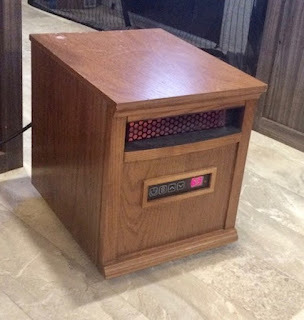 We love this heater! It has wheels that allow moving to the bedroom at nite. The heater has a remote control. Very convenient! The small heater has a fan which is very quiet. Twayler has a forced air heater. We hate the huge fan sound that the forced air heater makes. Hardly ever use it! Click [here] to view where we bought it. We are back on the Scampy Curtain Project. I've never taken hand sewing lessons. Back when I was a kid, I had do sewing and just did it. Sort of picked up different stitches here and there. For me, it is very difficult to cut cloth straight. Especially when cutting from a large piece of material. So, I don't concern myself about being perfectly straight. Just cut the material a bit big, and then sew up the material back to the size I want. As you may see in the pic below, the cut edge is not straight. I've folded the over the material into a straight line. And am holding the folded edge closed with paper clips. I will use a back stitch to secure the material on both ends. Then turn the material inside out. The temperature in Apple Valley today never got to 50℉. During the afternoon, my feet got uncomfortably cold. I was preparing a bucket of hot water to soak my feet when it occurred to me that the spa at 24 Hour Fitness would a lot better. So, that's what I did! It seems to me impossible for the little quartz heater that I Blogged about today at 8am to keep up with a 25℉ temperature plunge. As much we hate the fan noise, Twayler's forced air furnace may be pressed into service if as we expect, the quartz cannot handle the low temperature. 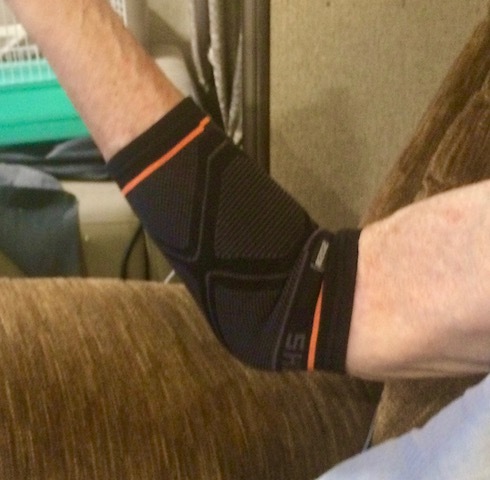 7:30am - Fortunately for seniors suffering with age related problems such as bursitis, the sports community has demands for physical protection products. I've bought two of these products. One is a forearm skin guard which protects against bruising that is so prevalent on a senior's forearm. The other product is an elbow sleeve with gel support. There is a pic below showing my right elbow, the one with bursitis. We just returned from visiting two body shops. When I jack-knifed Scampy, Little Honda's rear bumper got messed up. There was also very light damage to the panel just behind the left-rear door. We are going to let that light damage go for now. We received two repair quotes. One from Caliber Collision, which appears to be a no-nonsense first rate shop. Caliber quoted $1,003. The other quote is from Doug's Auto Body, which appeared to me to be a "we will wing it" shop. Doug's price is $400. I need more quotes to find out what's what? 4:45pm - Mark at A&B Hitch in Hesperia has committed to replacing the busted hitch on Monday. We have waited sooooo long for Scampy to be on-the-road again! We want to take a Scampy trip down to John & Mimi's to visit. Play golf. And pick up all the stuff we bought that was delivered to John's. Also, Cousin Jacky has given me an invitation for a Latke Party. Latkes are potato pancakes. Latkes are a traditional food for Hanukah. I love to go to Cousin Jacky's parties because lots of the family are there. The new elbow sleeve has been on my arm all day long. Except when I was soaking in the 24 Hour Fitness spa. I'm surprised that this sleeve is as comfortable as it is! Another sleeve is on the way. A slightly larger size sleeve. This 2nd sleeve is for comfort comparison. 9:30pm - Give it good hit! The modem that Dish furnished with our internet system has not been working well for about three days. This morning Dish sent us a new modem via UPS. That new modem may arrive around next Wednesday. But this evening, the old modem stopped completely. I guess that I got pissed off, because I pounded that old modem on the counter. Really hard!!! About four times.